Spring cleaning season is finally here. Yes, dusting and tidying up is all worth the work, but what if that’s not the problem? Are you on a mission to save space in your kitchen this spring? For renters, apartment kitchens tend to be more compact and saving-space takes some skill. 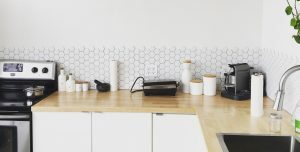 We rounded up a few quick and painless fixes to help get your small kitchen into tip-top shape. Your new-found efficiency will be worth the effort! Coffee machines, toaster ovens, candle warmers, and even those adorable, light up signs that spell, “eat,” all have one thing in common…. an electrical cord. Cords can be an eyesore when they are all bunched up together. The last thing you want in an already crowded apartment kitchen is a messy counter with cords sticking out everywhere. The simplest tip is to use twisty ties or velcro to help manage longer cords and lessen the mess. Another really smart and handy tip comes from The Kitchn! They suggest hanging the cord from a discreet Command Cord Bundler and stick it to the back of the appliance. We love this tip. What was once messy is now concealed! Preventing electrical cords from getting in the way is one thing. But how do you create more counter space when you just don’t have much of it? Introducing an amazing space-saving item – the kitchen sink cover! It’s typically a slab of wood or cutting board that goes over your sink and adds more counter space to your small kitchen. Plus, it adds a gorgeous, rustic feel too! Tip #3 – One shelf, two shelves, red shelf, blue…. The right shelving can make a world of difference in a kitchen. 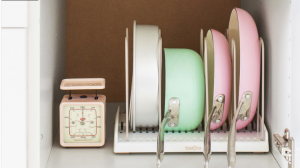 Here’s a list of 5 organizers mentioned in Good Housekeeping that you should absolutely own. Give your fridge or cabinets the organization it craves with clear bins, baskets, or shelf risers. Have space around your fridge? A mobile shelving unit can be your calling. Use pull out shelves in your fridge for more storage! Put a tension rod in the cabinet under your sink to hang cleaning products like spray bottles. Looking for more ways to improve apartment living? From utilizing the magic of indoor plants to keep the noise to a minimum, check out 10 Ways to Improve Apartment Life. Tip #1 – Get the clutter off your counter by hiding those electrical cords. Tip #2 – Expand your counter space with a kitchen sink cover. Tip #3 – Utilize different shelving units to help you save space.